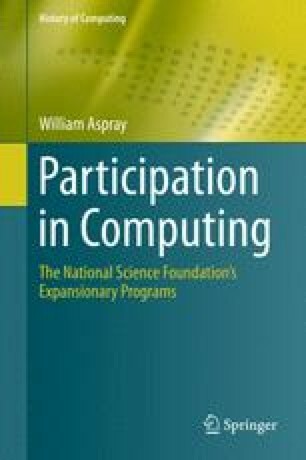 This chapter provides an introduction to the book by covering two topics: the extent and importance of underrepresentation in computing, and the place of computing in the organization and programs of the National Science Foundation over time. Women, African Americans, American Indians, Hispanics, and People with Disabilities have been significantly underrepresented in computing since at least the 1980s. Computing was one the last of the content-oriented directorates to be founded within NSF; it was regarded in two different ways within the NSF, as a science in its own right and as a servant to other sciences; and this dual view has caused tensions from time to time as to where to place funding and effort. This chapter also describes the early history of computing education and computing infrastructure programs at NSF. These programs were directed at the entire community, not particularly at minority-serving institutions or at student populations underrepresented in the computing field. While there were occasional concerns at NSF about underrepresentation in the science and engineering disciplines during its first three decades, it was only around 1980 that NSF made a major effort to broaden participation. Barker, L., C. Mancha, and C. Ashcraft. 2014. What is the impact of gender diversity on technology business performance? NCWIT Research summary. http://www.ncwit.org/sites/default/files/resources/impactgenderdiversitytechbusinessperformance_print.pdf. Accessed 9 Sept 2015. McKinley, K.S., and T. Camp. 2013. Diversity drives innovation. Computing Research News 25(5). http://cra.org/crn/2013/05/expanding_the_pipeline_diversity_drives_innovation/. Accessed 19 Oct 2015. National Science Foundation. N.d.a. Cyberinfrastructure: From supercomputing to the teragrid. A special report. http://www.nsf.gov/news/special_reports/cyber/fromsctotg.jsp. Accessed 8 Sept 2015. National Science Foundation. N.d.b. Cyberinfrastructure: A brief history of NSF and the Internet. A special report. http://www.nsf.gov/news/special_reports/cyber/internet.jsp. Accessed 8 Sept 2015. Presidential Information Technology Advisor Committee. 1999. Information technology research: Investing in our future. Report to the President, 24 February. https://www.nitrd.gov/pitac/report/. Accessed 8 Sept 2015.